We’d love your help. Let us know what’s wrong with this preview of The Diary of Marie Landry by Stacy Allbritton. During the Great Upheaval of 1755, the British forced the Acadians to leave their homes in the Canadian Provinces. Fourteen-year-old Marie Landry and her family thought they had found a new home in Maryland, but ten years after the Great Upheaval, they must join a mass exodus to Louisiana where land awaits them. In this heartfelt collection of diary entries, Marie document During the Great Upheaval of 1755, the British forced the Acadians to leave their homes in the Canadian Provinces. Fourteen-year-old Marie Landry and her family thought they had found a new home in Maryland, but ten years after the Great Upheaval, they must join a mass exodus to Louisiana where land awaits them. In this heartfelt collection of diary entries, Marie documents her journey. Beginning with Marie's fourteenth birthday when she received the diary, eleven chapters of this historical fiction document her exile with the Acadians following their expulsion by the British. Marie reminisces about her family traditions in Maryland and recalls the illness she experienced while sailing aboard the Elizabeth in the Atlantic Ocean. After reaching the Mississippi River, Marie expresses the excitement she felt the first time she saw the waterway and tasted Creole food. Marie also conveys the feelings of joy and sadness that she experienced throughout the journey. To ask other readers questions about The Diary of Marie Landry, please sign up. I wrote this book - so, naturally I give it five stars! 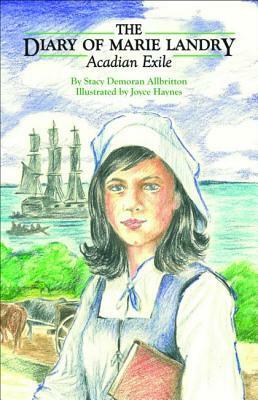 This is a historical fiction novel for young readers - the tale of Marie Landry, a fourteen-year-old Acadian exile who sails to Louisiana with her family in 1765. Marie chronicles her journey and her feelings of hope and anguish through candid diary entries. Wonderful book! I've given it to young ladies to introduce them to Louisiana history and Cajun culture.